Kona erinnert sich, wie die Beach Boys ihre Pop-Hits am Pool spielten. Die Band verließ die guten Vibrationen. Gelegen auf 9. 5 gated Acres, mit einem erstaunlichen hawaiianischen Plantagenstilhaus mit getrennten Schlafbereichen und einem Gästehaus gated. Ein Pool-Whirlpool, eine Gasfeuer-Feuerstelle und ein Tennisplatz vermitteln ein Gefühl von Mini-Resort. Reife tropische Obstbäume schützen exotische Blumengärten. Im Alter von 16 bis 60 Jahren umarmten Baby Boomers den Traum eines endlosen Sommers, der durch die Musik der Beach Boys hervorgerufen wurde. Ob Sie sich von der parkähnlichen Landschaft, dem abgeschiedenen Inselurlaub, dem atemberaubenden Meerblick oder der Idee, mit Rock & Roll-Geschichte zu leben, angesprochen fühlen. Diese einzigartige Immobilie wird Ihre Fantasie anregen. In der Mitte des Multistrukturkomplexes ist ein großes Haus im Plantagenstil ein Verdienst eines kalifornischen Architekten, der sich zusätzlich bemüht hat und die Essenz eines hawaiianischen exotischen Rückzugs einfängt. Bestehende Grundrisse belegen, dass das Haupthaus und das Gästehaus 1972 für Steven und Mike Love entworfen wurden. Von seiner kühlen, komfortablen Höhe von 1.300 Metern bietet die größte Residenz einen Blick auf die Küstenlinie von Kona, der sich auf Kealakekua Bay und Kona erstreckt. Mittwochs können Sie das Kreuzfahrtschiff im Hafen sehen. Hinter dem Eingangstor steigt eine konkrete Zufahrt zu einem Tennisplatz mit regulierter Größe an. wo die Band oft für Partys spielte. Ein abgeschirmter Raum neben dem Platz wird als Fitnessstudio des derzeitigen Eigentümers verwendet. Die wunderschön umgestaltete Küche und drei der viereinhalb Bäder enthalten Fliesen, die speziell für die berühmten ursprünglichen Besitzer angefertigt wurden. Das Haupthaus verfügt über drei Schlafzimmer und 3 1/2 Bäder. Die Gäste können auch das 2-Schlafzimmer Ohana (Gästehaus) nutzen, das aus 1 Queensize-Schlafzimmer, 1 Schlafzimmer mit Doppelstockbetten, 1 Badezimmer, einer voll ausgestatteten Küche und einem Wohnzimmer besteht. Reife Mango, Kaffee, Avocado, Limette, Orange, Banane, Papaya, Passionsfrucht und eine Auswahl anderer tropischer Obstbäume bilden die Grundlage für mehrere schattige Gärten mit exotischen Blumen. Wenn Sie nach einem friedlichen Versteck suchen, müssen Sie das Beach Boys 'Estate sehen. Sie können die Musik hören, die guten Schwingungen spüren und niemals die Wärme der Kona-Sonne verlassen. We had a wonderful stay, thank you! The space was perfect for our group, which had both adults/couples and families with small children. Any question or issue we had was answered immediately, no matter the time of day or night. The pool/hot tub area is particularly fantastic, with an incredible view, especially at sunset. We also spent a lot of time on the screened in porch, which was cozy and perfect for keeping bugs out and kids in! 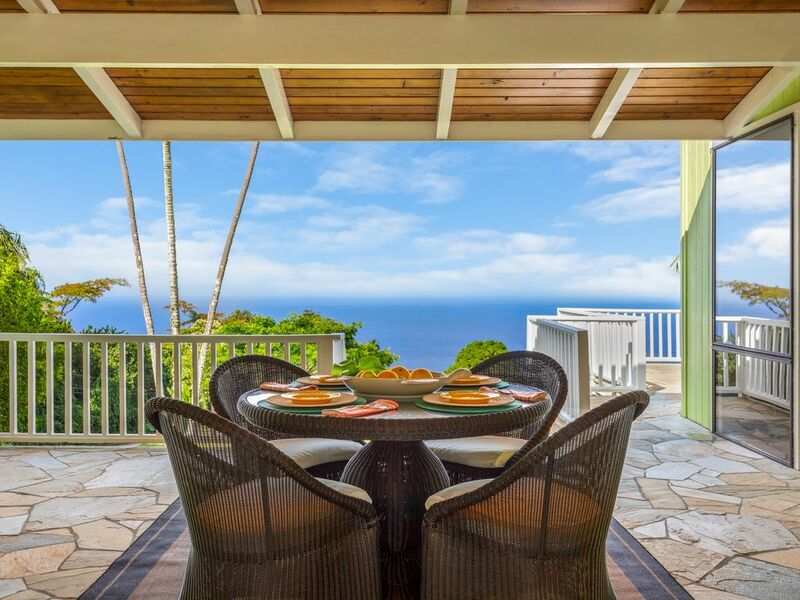 The owners have thought of everything, from pool loungers to boogie boards, and the cookware is appropriately sized and plentiful to accommodate cooking for a large group (a rarity in rental homes!). We would absolutely return for another stay; it was the family vacation of a lifetime. Worth knowing - the house is about 50 minutes from Kona. If you want to do a ton of organized activities (diving, cruises, luau), most of these are in town and require driving up/down the mountain on a curvy two lane road. If you are prone to carsickness, or don't want to do that much driving, there are lovely beaches, stores, and restaurants close to the house, but if you are interested in Kona-centric activities, I would plan them in advance on the same days (ex: diving AND dinner, snorkel cruise AND luau) so you're making fewer trips. This property is as special as the family who cares for it. The owners created a retreat for us to talk, laugh, explore, swim, read, enjoy fruit from the trees, view the sunset, and the moon over the ocean in the early, early morning. We swam in the pool. Played games on the tennis court, explored the grounds, listened to the birds. The kitchen and adjacent eating area easily accommodated all 10 of us. Our 10 day stay was over too soon. The house was amazing and perfectly accommodated our party of 12 (4 adults, 8 children). Guy met us when we arrived and took us on a tour of the property explaining where everything was located and how to operate various features of the property. Fresh fruit basket (mostly picked from the property!) and a bag of Kona coffee also greeted us upon arrival. They were the perfect hosts...allowing us our privacy, but quickly responding to anything we needed during our stay. His recommendations for island dining and other activities were excellent. We greatly enjoyed the privacy of the property and used our rental car for daily island adventures. The kids really enjoyed the swimming pool and tennis/basketball court on property. The adults enjoyed the spa and grilling on the pool deck. Kitchen was well stocked and had most any appliance needed for meal prep. Beach towels, bedroom and bathroom linens, games, laundry room, etc...there was no amenity we were lacking and everything was spotlessly clean. Every sunrise and sunset was a postcard. We had an amazing vacation and will definitely look to stay here again upon our return to the Big Island! Jeff B and his family were the perfect guests. They treated our vacation home in South Kona with the utmost care and respect. The home was left in immaculate condition. Communication was great for arrival and departure. We highly recommend Jeff for all levels of property rentals. Awesome view and very private! Had a great time with our family. Would definitely stay again. Owners were very helpful and house is very comfortable. The owners were on top of everything and so pleasant to have as hosts. We had a family trip that included a toddler and an infant and the owners provided a high chair, life jackets and floaties and a pack n play with sheets. They were very thoughtful and accompadating to specific needs we had. You will defiantly want a car to get most places and you’re secluded which is what we wanted so it was perfect. The property is super private and you don’t see any other homes, the only neighbors you’ll see are local cattle on the property next door. The pool also has small area that’s only a foot or so deep for toddlers and young kids which was great for us. The main pool area is deep enough for diving and swimming. We spent most the time in the spa which was perfect. The property has coffee plants, avocados, lemons, mangos and tons of other plants we didn’t recognize. The property is on a hill so not anywhere to run but just walking up and down the main road in is enough of a work out. The tennis courts are at the bottom of the hill with a small area to work out too. The guest house is about 50 yards away from the main house so it’s a nice separate space to have. Honestly, there’s nothing negative to say about this place. We have and run our own VRBO rental and the owners have this place dialed, we plan on coming back! Guy and is family took great care of us during our stay and the house was perfect for our group.